dietary supplement with high concentration of proantociandinas. Dietary supplement formulated with dry fruits of cranberry extract (Vaccinium macrocarpon), with 25% of Proanthocyanidins (PAC), and dry extract of flowers of Hibiscus (Hibiscus sabdariffa l.) with 5% anthocyanins and enriched with vitamin C for optimal alkalization of the urine. It ensures the intake of 36 mg of Proanthocyanidins in a unique outlet for added convenience. The urinary tract is one of the most important systems for the conservation of the cleaning and removal of toxic substances from the body. Diseases and problems that may have all or any of its organs are diverse and can manifest from retention of urine and infection problems until serious kidney problems. The normal mechanism of urination is extremely complex. Vegetative, sympathetic and parasympathetic nervous systems, as well as the motor nervous system through the abdominal muscles are involved. 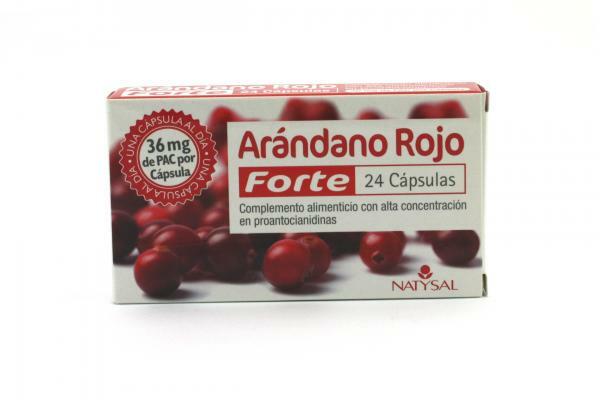 144 mg of dry extract of frutosw of cranberry (36 mg Proantociandinas). vitamins: 80 mg of vitamin C.
directions for use: take 1 capsule a day before the main meal. Presentation: Container of 24 capsules.